If you’re hoping to make your proposal a surprise then the style of the ring is probably the toughest decision you’ll have to make. But never fear, if you’re in a serious relationship then chances are she’s been dropping mad clues left and right. You just haven’t been looking hard enough. So, check your internet browsing history and bookmarks. Has she been visiting engagement ring sites on your devices? Has she bookmarked pages? Look at the magazine pile – any folded over pages? Ask her friends…if you think they can keep a secret. The clues are out there so keep looking. Once you’ve got the clues and buzzwords, check out the style guide below to see what it all means and find the ring of her dreams below. You may have picked up on some buzz words during your research. Pave, halo, tension setting, east-west? This guide will help you easily identify these styles and find the ring that’s right. Who wears this style: Everyone. Traditionalists. Minimalists. 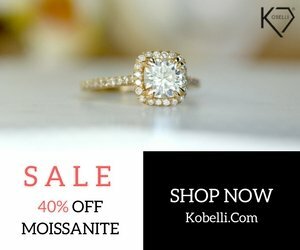 A solitaire engagement ring is a setting where one single diamond features prominently. While a solid metal band in gold or platinum is the most common setting for this style, pavee and cabled settings are also popular. A knife-edge solitaire with a six-prong setting is the style made popular by Tiffany & Co. and probably the most recognizable engagement ring style of them all. But luckily, you don’t have to pay Tiffany & Co. prices to get this look. Who wears this style: Girly-girls. Romantics. Classic Lovers. When a solitaire alone won’t do, a side-stone ring adds a little more pizzaz in an understated way. Pave or prong set stones on the shanks of the setting reflect light and add a little more oomph to your classic solitaire setting. 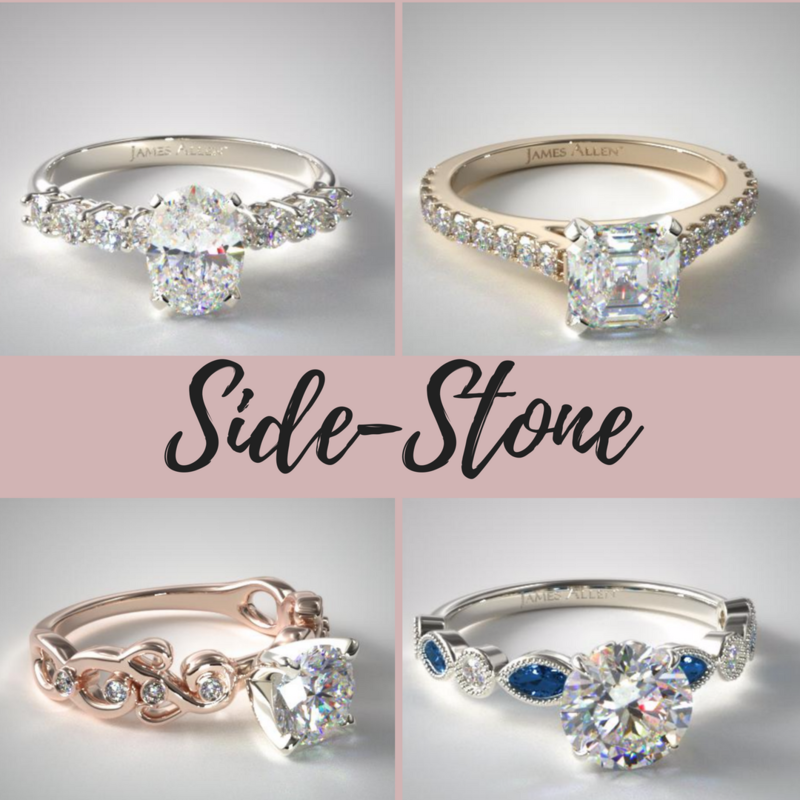 Side stones may be diamonds or semi-precious stones like emeralds, sapphires or rubies. Who wears this style: Bling-lovers. Symbolism seekers. Traditionalists. 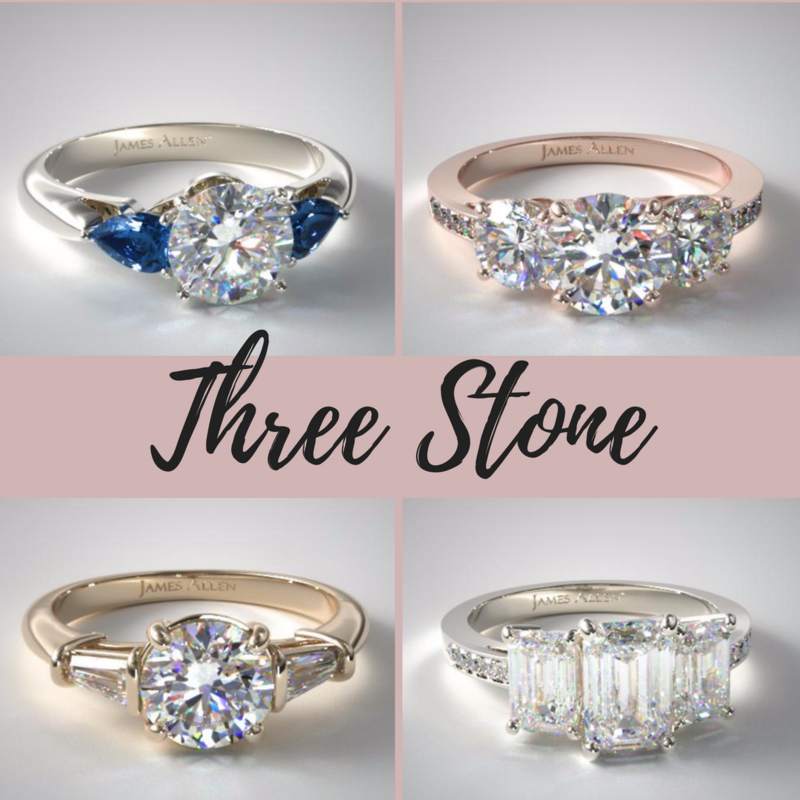 In a three-stone setting, a center diamond is flanked by two side stones – usually in the same shape as the center stone – creating a diamond front that provides maximum finger coverage. 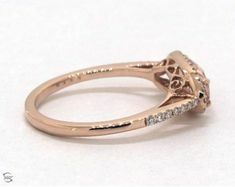 A three-stone ring can be all diamond or a combination of diamonds and other precious stones like sapphires or emeralds. Three stone settings with sapphires flanking the center diamond is a particularly popular look. This setting was made popular in the 1990’s when a DeBeers campaign touted the significance of the three-stone ring as representing your past, present, and future. 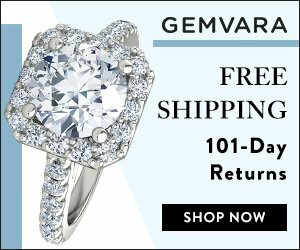 While the popularity of this setting has dwindled – making way for the halo setting, there are still many who opt for this style as a great way to incorporate multiple diamonds or gemstones for a hefty ring at an affordable price point. I’m predicting this style will have a resurgence in popularity now that Meghan Markle has a 3-stone ring and the next royal wedding is approaching. Who wears this style: Attention-Seekers. Fashionistas. Romantics. Extroverts. 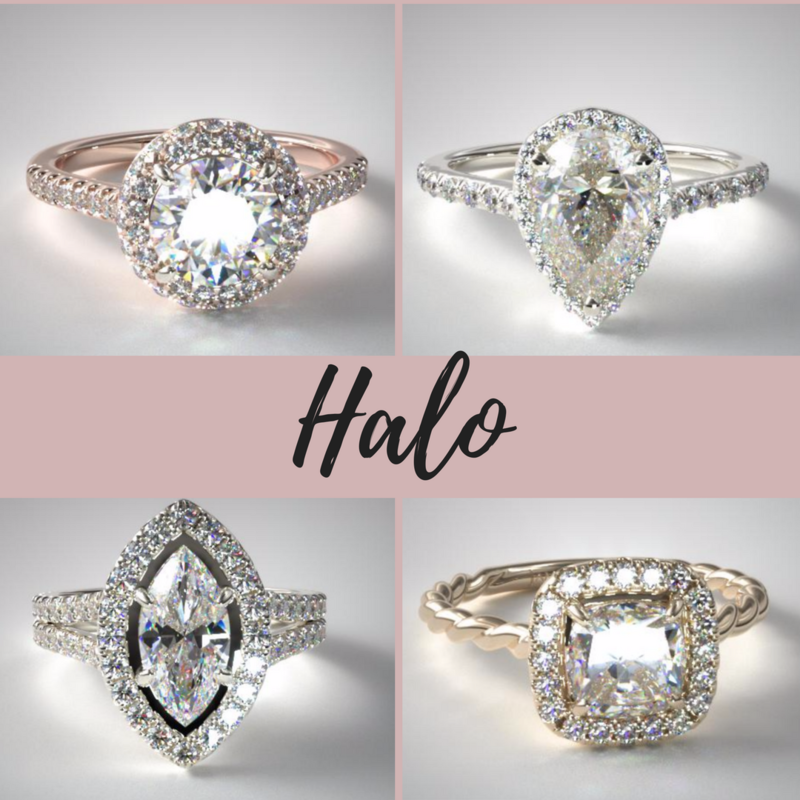 A halo setting is a type of composite setting where many small stones are combined to give the impression of a single larger stone. 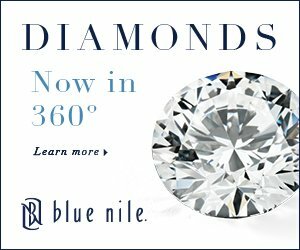 In the case of a halo, pave diamonds set in a “halo” encircle your center stone giving the impression of a larger center diamond. This is a great idea if you are looking to add some impact on a budget. 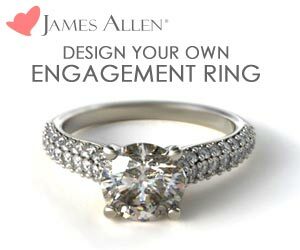 This setting works for almost any shape stone, though the most popular cuts are round and cushion cut diamonds. Gaining in popularity are marquise halos and pear halos. 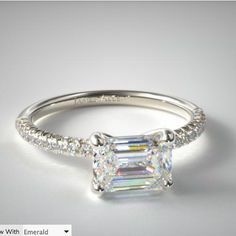 There are many variations on halo settings including split-shank – where the band appears to split as it wraps around the finger, Falling edge – where the pave diamonds are angled into the side of the crown giving a more 3-dimensional appearance, and double halo which is where 2 rows of pave diamonds encircle your center stone. Who wears this style: Modernists. Minimalists. Trailblazers. Thrill Seekers. 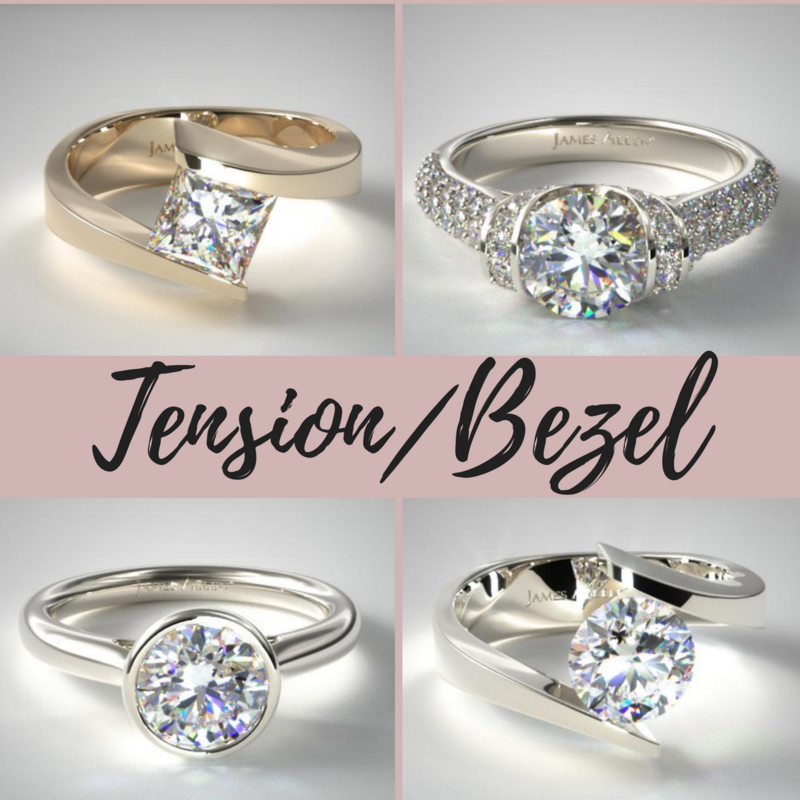 In a tension setting the main diamond is not held in place by prongs, but instead by the pressure of the metal setting on the stone. A variety of different styles fall into this category including bezel settings, semi-bezels, and contemporary gravity-defying tension settings. On a practical note, bezel settings are favored by professionals who work with their hands or are frequently putting on and removing gloves as the prong-less setting is less likely to catch on objects and provides a low profile setting. Who wears this style: Nostalgics. Romantics. History Buffs. Tree Huggers. 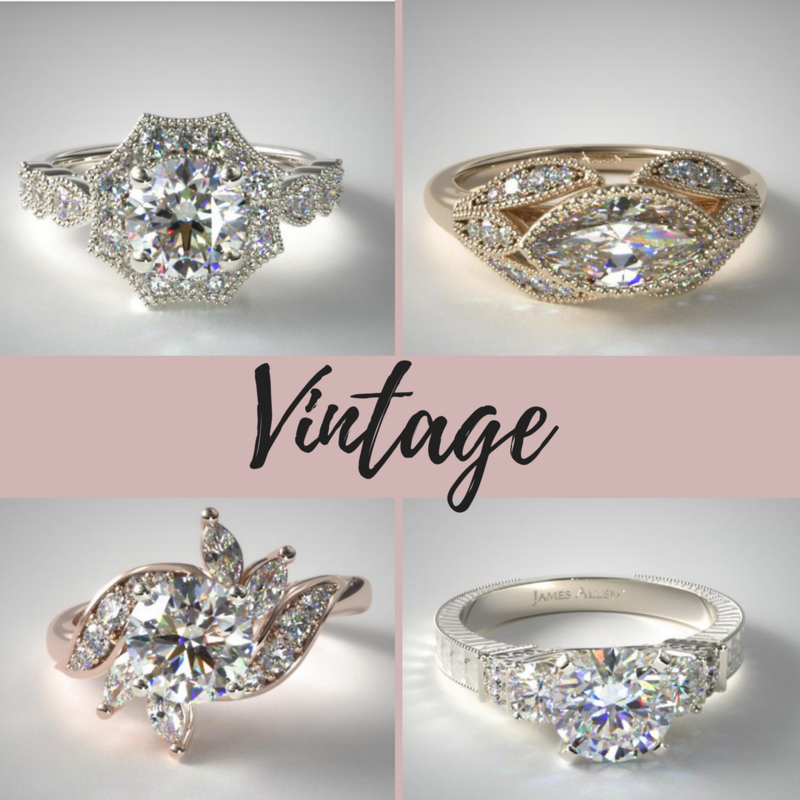 Vintage styles incorporating details from days gone by and are generally known for incorporating details like milgrain, split claw prongs, and old mine and rose cut diamonds. If your intended has dropped hints for this style of ring, do try to get more details to determine whether she just loves the style of these rings and would be happy with a brand new ring made in a vintage style, or whether she has her heart set on a real antique ring. 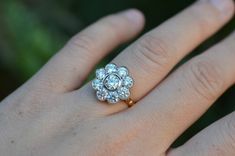 Many favor vintage styles if they are looking for conflict-free diamonds. You can read more about that here. While others are simply intrigued by the flourishes vintage styles provide. Victorian: 1837-1901 Hearts, bows, and floral motifs set in platinum or gold. Edwardian: 1901-1920 Feminine styles utilizing filigree techniques with an emphasis on florals, lace and bow motifs. Art Deco: 1920-1935 Colorful stones, bold designs with sharp lines and angles. Who wears this style: Non-Traditionalists, Trendsetters, Individualists. Gaining in popularity, East-West settings are a fresh take on more classic styles. 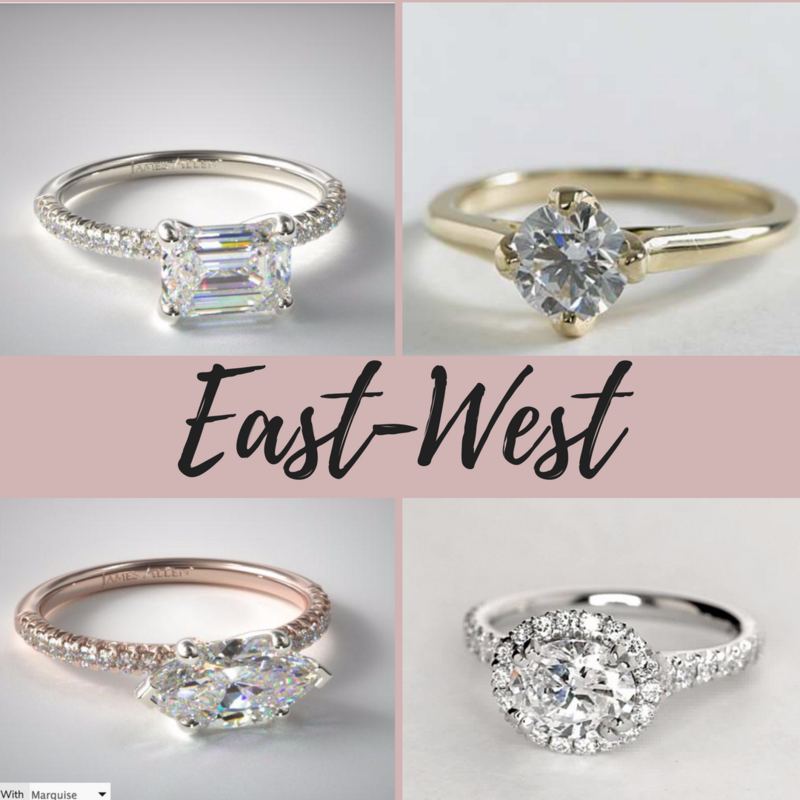 The term East-West refers to the orientation of the center stone’s setting – where the diamond is placed left to right instead of up and down. 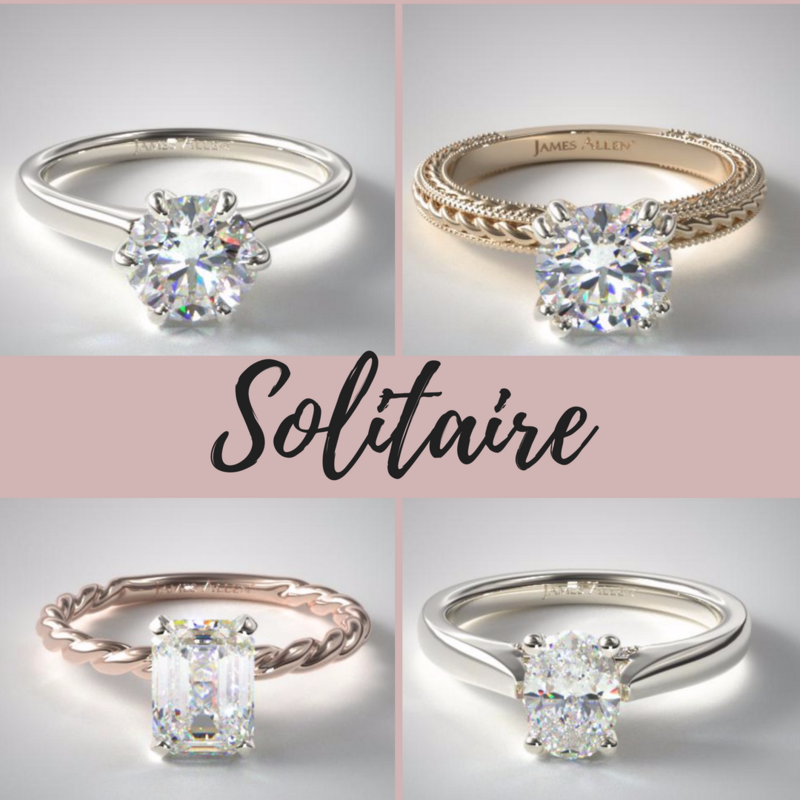 These horizontally set engagement rings can take on any style from classic to modern and can be incorporated into halo settings, solitaires or even multi-stone settings. Ready to find your style? Start shopping today, and contact me for more help picking out her dream ring!